What Are the Causes of Struvite Crystals in Cats? If your kitty strains to urinate, one cause may be struvite crystals. 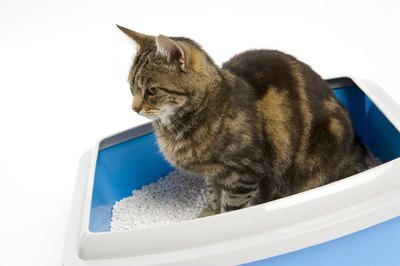 Your family feline may be prone to developing urinary crystals. One form of crystal is known as struvite, made up of phosphate, ammonium and magnesium. When these crystals become large enough, they make urination painful for your kitty. If she becomes obstructed, this is a medical emergency. Your kitty’s urine pH can make her more vulnerable to developing struvite crystals. When your vet completes a urinalysis on your cat, he may find that her urine is higher in magnesium and phosphorus. Your cat’s urine may also be more highly concentrated than that of a cat who is not prone to developing struvite crystals. If your kitty doesn’t urinate very often, her urine sits in her bladder for a longer time period. As more urine accumulates in her bladder, it becomes more and more highly concentrated, causing ideal conditions for crystal formation. Should your kitty have developed a urinary tract infection, she’s now more likely to go on to develop struvite crystals in her urine. Because she had foreign materials, such as bacteria, in her urine, struvite development is more likely. Your vet will be on the lookout once your kitty recovers from her UTI. He wants to make sure he diagnoses crystal formation so he can prevent a medical emergency. This is one for your veterinarian to determine -- if your cat has a small urethral opening, she won’t be able to release the same amounts of urine in one visit to her litter box as a cat with a normal-sized urethral opening. This allows urine to sit in her bladder for longer periods of time, making it easier for struvite crystals to form. Along with the crystal formation, she’s more prone to developing an obstruction of her urethra. This is a medical emergency, requiring immediate veterinary attention. Your kitty’s system is prone to struvite development, which leads to painful urination and straining when she’s in her litter box. The sharp edges of these crystals scrape against the interior of her bladder, which leads to blood in her urine. As the crystals grow, she begins showing symptoms of cystitis, including frequent attempts to go, straining, not passing much urine and that bloody urine. If your cat is prone to high quantities of minerals in her urine, these can bind to foreign tissues in her bladder, along with other inflammatory materials and blood. Urinary crystals that are lodged in your kitty’s bladder and urethra have to be either surgically removed or flushed out of her body. Once they have been removed, your vet will prescribe antibiotic treatment to prevent any subsequent infection. Because she has developed crystals once, she may now be prone to them. Your vet may prescribe dietary therapy, meaning a special cat food that assists in dissolving any remaining crystals and preventing the formation of new ones. These foods change the composition of her urine to a more acidic pH. Her new food will also have more salt to make her thirsty. When she drinks more frequently, her urine will be less concentrated. She’ll also urinate more often. Are Hedera Helix Poisonous to Cats? What Is Interceptor for Dogs? Does a Ticking Clock Help Stop a Puppy From Crying? "How to Condition a Dog on Hills, Stairs, and Agility"
How Often Should You Groom Your Dogs?